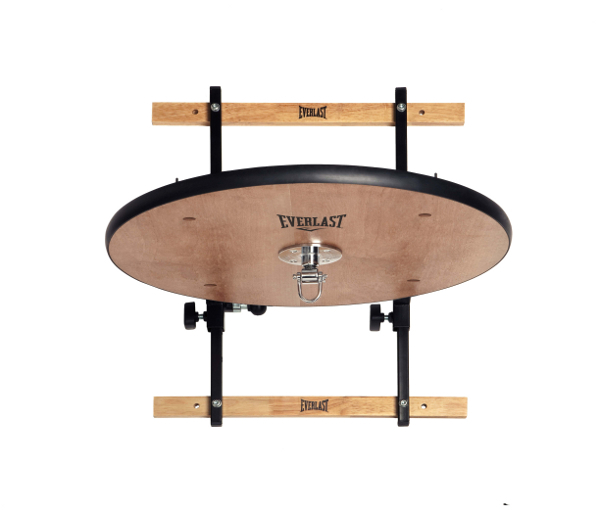 Speed bags of any kind can be comfortable mounted on the wall with the Everlast Speed Bag platform. The Everlast Speed Bag platform offers several possibilities for a varied boxing workout: stamina, speed, reaction, and coordination can be intensively exercised. The reinforced steel frame of the Everlast Speed Bag platform provides stability. The wood platform is height adjustable and can be adapted according to height of the user. Kotikäyttöön hyvä tuote. Hinta-laatusuhde erinomaisesti kohdillaan. Levyn päälle kannattaa laittaa hieman lisäpainoja, jolloin telineen vakaus paranee ja palloa on miellyttävämpi lyödä. An und für sich stabile plattform. Manko: höhenverstellung zu knapp an d. Wand. Zusätzliche beilagen und längere schrauben werden benötigt.Kein Pro Swivel! Lett og montere. God kvalitet. Everlast Swivel Professional In stock!